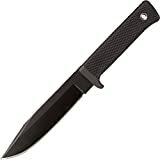 The SRK (Survival Rescue Knife) has been a staple in Cold Steel’s catalog for well over a decade. In its role as the company’s go to mid-size survival / utility knife, the SRK has been selected as standard issue for U.S. Navy Seal team members going through BUDS (Basic Underwater Demolition/Seal) training. With that kind of pedigree I doubt I will be able to add much to the conversation that hasn’t been already been discussed, but this blade has been in my collection for some time now, and I have always wanted to do a full review on my SRK. The SRK has an overall length of 10-3/4 inches, a 6 inch blade, and the knife weighs 8.2 ounces. I believe the sheath on this knife is 4 ounces, bringing the overall carry weight up to a very respectable 12 ounces. What I like about the SRK is the versatility a blade like this offers. Of course the “Survival Rescue” moniker suggests that this is both a survival and rescue knife, but the SRK could also be used as a combat knife or as a camp/utility blade. In my case, the SRK serves as something of a bug out bag knife, although I have occasionally pressed it into service. For example, it accompanied me on my last trip up to Canada where I did a fair bit of wood processing with it. The blade on the SRK is a classic clip point. Cold Steel started with a 3/16″ (4.75mm) thick piece of steel, gave the knife a hollow grind starting 2/3 of the way up the blade, and added a swedge to form a very fine tip. Cold Steel has applied a black coating to the blade. The coating comes off easily under use, and is not included on their laminated stainless San Mai III version of the knife. I have run a battery of tests on the knife (covered in the video) in addition to general use over the years. I found the knife has held up reasonably well under a variety of tasks including carving, light chopping, and batoning. The partial flat grind splits wood easily, and the thick spine makes the knife fairly comfortable when used for draw cuts with the spine backed up against the knee. The tip is needle sharp, but it held up really well – even after boring several holes through a hardened 2×4. While the blade lacks the weight and refinement of something like the Fallkniven A1, it did cut pretty well. I wasn’t blown away by the SRK’s performance, but I found I was able to get through a variety of tasks without too much trouble. The SRK was originally made in the USA and featured Carbon V, a nice beefy high carbon steel, for the blade material. These days the SRK is made in Japan and comes with either an AUS 8 blade (shown here), or the aforementioned San Mai III blade. San Mai III is Cold Steel’s proprietary laminated stainless steel featuring a VG1 core. Unfortunately I haven o experience with San Mai III yet. AUS8 is a steel that people seem to love to hate. I’ll admit, in the world of exotic steels AUS 8 isn’t the sexiest choice, nor is it the absolute best in the edge retention department, but when AUS 8 is done right I happen to like it for a number of reasons. In my experience Cold Steel does a great job with their AUS 8. For example, I thought the results from my cut test with the CS American Lawman was especially impressive (well, at least I was impressed). True to form, I found the AUS8 blade on the SRK easy to maintain, very tough (no chipping or rolling), and capable of getting extremely sharp. When working with wood I found the SRK held it’s edge nicely. When I switched over to cardboard I found the knife did lose it’s luster after working through a few boxes, but considering the primary intended use for this knife (a woods knife – not a box cutter) I thought Cold Steel did a good job here. This is a tough steel that is not likely to chip out, and should hold up well under general outdoor tasks. For the money (~$75) I think it’s a decent choice. The tang of the SRK is encased in a thick kraton handle. Kraton is a high density rubber commonly used as a handle material for survival knives. The large handle fills the hand and is heavily textured to provide a secure grip. There is a finger guard (quillon) that keeps your fingers in place, and a lanyard hole large enough to pass 550 cord through. I found the handle to be comfortable – even after extended use. Kraton is nice because it’s rubbery qualities help absorb shock. The straightforward handle design didn’t form any hot spots. I found the texturing struck a nice balance between being practical for use with bare hands (even wet/sweaty ones) without being irritating. One thing I noticed about the SRK is that after batoning and chopping the handle is ever so slightly loose around the blade now. This is a pretty common occurrence on the SRK, and is something to consider before purchasing. Some people inject epoxy into the handle when this happens – my handle hasn’t gotten that loose yet, but I may decide to go this route eventually. The sheath is probably my favorite part about the SRK. Originally the knife shipped with a leather sheath, but Cold Steel upgraded that a few years back when they switched over to a Secure-Ex (molded plastic) sheath. I really like how many options you get with this sheath, and the fact that it is generally well made and sturdy. For starters there is a nylon belt loop that is both reversible for left or right carry, and fully removable in the event you don’t want to carry the knife on your belt. This belt loop also includes a quick release so you don’t have to take off your belt to attach or remove the sheath. The sheath itself is sturdy and lightweight, and is ringed with rivets for paracord. There are also wider slots to weave straps and belts through. Retention is excellent and the knife slides into place with a firm “snap.” Rounding things out is a small drainage hole – always nice to see. All in all this is an excellent sheath that provides its user with many options for carry. It is easy to see why the SRK has remained in Cold Steel’s lineup for such a long time. This knife is simple, rugged, and versatile. While it doesn’t excel at anything, it does a decent job with pretty much everything. If you need one relatively lightweight knife to handle tasks from food prep and carving, to light chopping and batoning, the SRK has you covered for well under $100. I am not a fan of how the handle loosened up after use, and I am sure some will not be impressed with the selection of AUS8 steel, but I am a big fan of the sheath and generally see merit in this compact offering from Cold Steel. While I don’t think it is anywhere in the same league as the Fallkniven A1 (a knife it sometimes gets compared with), the SRK is a nice knife in it’s own right, and can be had at a fraction of the cost. I recommend purchasing the SRK at SRK or BladeHQ. Purchasing anything through any of the links on this site helps support BladeReviews, and keeps this review train running. As always, any and all support is greatly appreciated! AUS8 is not a steel I trust to hard jobs. I do not trust it in blades past 5inches. Remember to use such knives as knives and not sharp pry bars and you’ll be ok but there’s too much temptation for most people to do so. Also as I said before, this is the knife the A1 is based on. VG1 and VG10 are made in the same factory. I would not be surprised to see that the laminate blades were made in the same shop also. Good post as usually. I’m happy to see a lot more fixed blades being reviewed. Thanks RK. Since I graduated I’ve had a little more space to work with and have enjoyed testing out fixed blades more. Expect to see more fixed blade (and even some machete) reviews in the future, although I will be examining a nice folder next. I would agree that this knife is best for light to medium use. I have yet to take AUS8 to its limits – it would be interesting to perform a “destruction test” on it to see how well it holds up, but I’m not really equipped to do that. I’d say for your average camp / outdoor chores you should be fine, although it would be nice if CS brought these back with Carbon V blades. A-1 every day and twice on sunday, but I do like my CarbonV S.R.K, but again my go to knife that’s not laminated is my Ratmandu first I like a choil, and the handle is a very comfortable micarta handle that just feels great, same with the steel the SR101 hold’s a much better edge, but I can’t complain with my CarbonV S.R.K it lasted me a while now and is still in great shape and I do baton wood, but maybe the bad taste cones from my new San Mai S.R.K the hollow grind and the tip is so thin I’m afraid to use it in the bush and use it like I use my CarbonV S.R.K, I don’t think the Seal’s use the San Mai version it just doesn’t seem to be a strong knife and that’s one of my requirements for a bush knife, But I like the fact that the Recon Scout and the Trailmaster are being made in O-1, and maybe just maybe they will come to their sense and make tge S.R.K. The same way they made it in the CarbonV but in O-1. Dan – I like your review and the comments posted thereunder. After all these years, I finally bought a Cold Steel SRK. It fits the bill for Buds/Force Recon and similar uses. I am very pleased with the purchase. Glad to hear you are enjoying your SRK! It’s a nice offering from Cold Steel and mine has done well in a camping / utility capacity. It was designed for survival / rescue type applications so maybe it would fare well in a more professional capacity as ell. I am a big fan of the Fallkniven F1 – a beautiful and elegant knife, but also a proven performer. I would like to check out more Ontario fixed blades. Sadly I haven’t reviewed any beyond the machete, but I know models like the Ontario 6 and SP2 have been well received. Too many knives, too little time!